Hosting the only international airport in French Polynesia, Tahiti is often perceived as merely a stopover on the way to other islands like Bora Bora, Moorea, etc. What many don’t realize is Tahiti is, in its own right, a magical destination. A world of adventure is waiting to be discovered on this culturally, and agriculturally, rich island. Cascading waterfalls, rivers, black sand beaches, forest treks, and some of the best surfing in the world beckon those travelers with a sense of adventure! Here are some of the lesser known activities that reveal an adventurous, unspoiled Tahiti. Tahiti has several hiking trails that will take you in to its beautiful interior, have you ascending mountains, or exploring the lava tubes created during the birth of the island millions of years ago. One of the best ways to discover Tahiti’s pristine and unspoiled interior is on the Fautaua Valley trail. 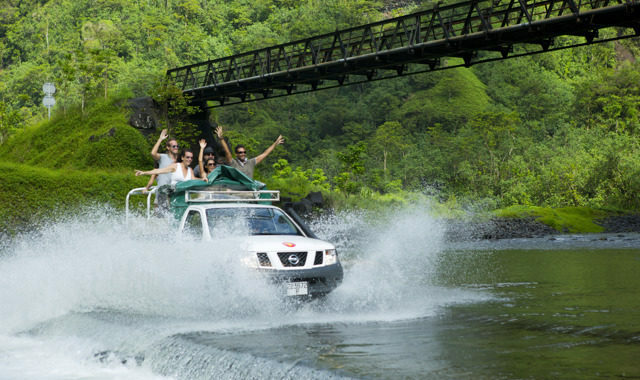 You’ll begin at Papeete Town Hall and follow a marked route into a jungle of babbling streams, wild banana trees, lush mango groves, and the 450- foot-high Fautaua Falls. More experienced hikers can continue the steep climb to the top of the cascading falls for spectacular views. On Tahiti’s rocky east coast, you can explore the volcanic Lava Tubes of Hitiaa. These underground channels were formed eons ago, a result of a chain of volcanic activity giving birth to the island. With the help of an expert guide, you can traverse cool-aired mossy caverns in a Mars-like landscape, and shimmy through rock tubes by headlamp. You’ll then emerge to shards of sunlight peeking through the rocks and be welcomed by natural bathing pools, cascading waterfalls, and verdant foliage. At the end of the Lava Tube trek, you’ll be welcomed by natural bathing pools, verdant foliage, and refreshing cascades of water. Image courtesy of Tahiti Tourisme. Did you know Tahiti is the birthplace of surfing? It’s also home to the Billabong Pro Championships held each year in August. The island offers excellent opportunities for beginning surfers and if you’re a surfer newbie, we recommend spending half a day of private instruction with international surf champion, Michael Demont. For advanced surfers seeking a thrill, you’ll find it at Teahupo’o, home to one of the world’s most powerful waves. See more ways to experience Tahiti by water! Image courtesy of Tahiti Tourisme. The Papenoo Valley (the islands largest valley) is a magical place rich with waterfalls, lush tropical plants, and archaeological sites known as marae. Far from the hustle and bustle of Papeete, the Papenoo Valley is a relaxing destination filled with natural beauty and relics of ancient Polynesia. We recommend a 4WD tour as many of the sites are accessed by dirt roads, or by traversing shallow rivers and streams. You’ll find the tour guides to be passionate about their Tahitian heritage, and eager to share their knowledge of history, geology, as well as therapeutic uses of the local flora and fauna. Discover more to see by land in Tahiti! A marae in the Papenoo Valley. Tahitian ancestors worshiped and celebrated at these sacred sites. Image courtesy of Tahiti Tourisme. Spend the day driving the 70-mile loop that takes you around the island. You’ll experience the wild and rocky east coast with its striking black sand beaches, and the milder west coast dotted with peaceful lagoons perfect for swimming. Take the day at your own pace by renting a car (it’s a very easy drive with just a single road) or join a guided tour. Travelers in August through October have the fortunate opportunity to witness humpback whales migrating from Antarctica. Head out with a professional guide to get a close-up view of these beautiful creatures. Tahitians love food and we’d be remiss if we didn’t give it a solid mention here. Naturally, the island is abundant with fresh seafood, coconut, and produce all locally sourced and abundant. But you’ll also find a unique amalgamation of French and Asian inspired cuisine in a variety of restaurants from food trucks to luxury, Michelin-quality establishments. Here are some of our favorite restaurants in Tahiti. If you’re looking for a unique experience, we recommend dining as the locals do at Les Roulottes, a Tahiti tradition established well before food trucks were cool. Located on the waterfront, these restaurants on wheels gather nightly on the waterfront and serve up international cuisine in unpretentious style. Here you’ll find sushi and sashimi, barbecue, burgers and fries, crepes, Asian stir-fry–there’s something for everyone! This eclectic, and economical, gourmet experience is not to be missed! Les Roulottes, the food trucks of Papeete. Photo courtesy Peter Gill / UK. For a closer look at the island of Tahiti, including recommended resorts, vacation packages, restaurants, and activities, visit the Tahiti Island section of our website at https://www.gotahiti.com/islands/tahiti/.